Ravinder Dagar, 41, is a telecom professional and his wife Kavita, 38, is a government employee. The couple lives in a rented house in Delhi with their daughters Vedanshi, aged 14, and Priyanshi, aged 8. Together, they bring home a net salary of Rs2.58 lakh and also have a rental income of Rs25,000 from their house located in Delhi and worth Rs30 lakh. Their monthly outflow is around Rs1.12 lakh, leaving a surplus of Rs1 lakh post actual investments. In addition, they own a plot of land and some agricultural land, both valued at Rs15 lakh. The Dagars have a big dream - that of sending their daughters to Harvard University. The parents want to fund their daughters' Ivy League education (at least, a big chunk of it), want to save for their marriages and build a retirement corpus. The family has done well by setting up a contingency fund and buying a spate of health insurance policies. However, they do not have adequate life insurance and disability cover. The couple has invested in equity/balanced mutual funds via monthly SIPs, and also put their money into gold and the stock market. But the equity exposure is low, considering their high-cost long-term goals. Moreover, direct investments into stock market require in-depth research and analysis for which they may not have the time and/or expertise. So, they should sell the stock and invest the capital in diversified equity mutual fund schemes. Also, the family has kept most of its deposits lying idle in the bank. Investment returns from fixed deposits and postal schemes are low and subject to taxation as per individual tax slabs, which will further reduce overall returns (see table Assets and Net Worth). Therefore, they need to realign their investment strategy in sync with their short-term targets and future goals. 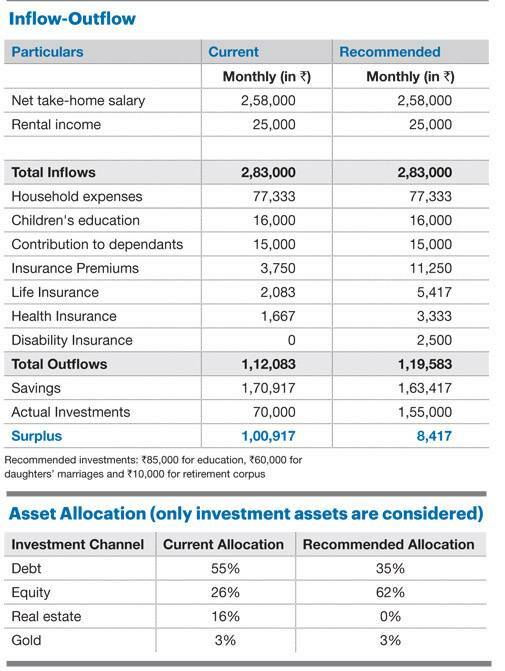 The financial plan presented here is based on the information provided by the family (see tables Inflow-Outflow and Asset Allocation). The plan also assumes that dual income will continue till Ravinder retires. They are also advised to review the plan and rebalance their portfolio periodically, preferably every year. Contingency: To meet emergency requirements, the family must keep a contingency fund which will cover at least three months' expenses. The cash in hand, amounting to Rs4 lakh, has been allocated for this, and the money should be invested in an ultra-short-term fund for liquidity. When their incomes rise, this amount should be raised to equal six months' expenses. It should be strictly earmarked for emergency purposes only. 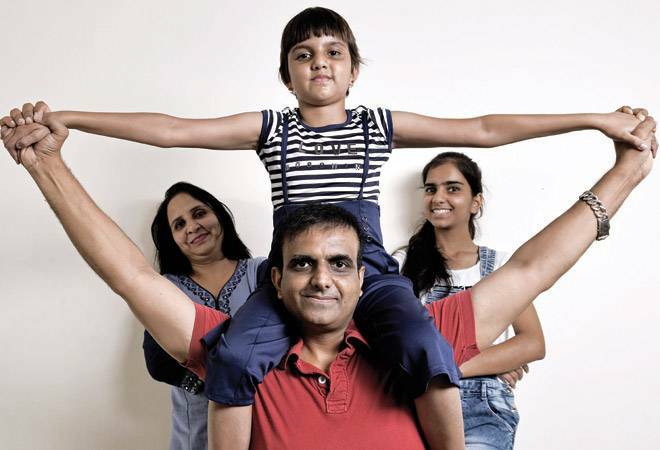 Life insurance: The Dagars have purchased one traditional plan and are paying a monthly premium of Rs2,083 for the same. After taking into consideration the present surrender value, future premiums payable and the expected maturity value based on current bonus rates, the IRR of a traditional LIC plan is likely to beat inflation. Hence, they are advised to continue the plan as part of their debt portfolio. As per the need-based theory, the family does not have an adequate life cover. Ravinder requires a total life cover of Rs1.5 crore while Kavita needs Rs50 lakh. Each should buy an online term plan for 20 years. Put together, these policies will cost around Rs40,000 a year. Health and disability cover: The couple has purchased a family floater plan and should continue it. The plan comes with a room rent sub-limit of 1 per cent of the sum assured, which means if the room rent in a hospital is higher than this limit, all other allocations will be reduced accordingly. They should also buy a top-up plan for the entire family, with Rs15 lakh sum assured and a deductible of Rs5 lakh. It will cost around Rs20,000 per year. The family should also purchase critical illness insurance worth Rs50 lakh besides an accident disability insurance of Rs50 lakh for Ravinder and another worth Rs25 lakh for Kavita. This package will cost them around Rs2,500 a month. Health insurance policies also help in tax planning. For instance, the premium paid up to Rs25,000 for self and family and an additional Rs50,000 paid for parents will be deducted from one's total income u/s 80D of the IT Act. Retirement: As both of them are planning to retire at 60 and their life expectancy has been set at 80, they will require a corpus of Rs6.8 crore. The amount has been determined assuming that monthly household expenses will be Rs80,000 in present terms, including 7 per cent inflation. To reach this goal, the family should shift from direct equity investments to diversified equity mutual fund schemes. The Dagars should make a monthly investment of Rs10,000 via SIP in a diversified equity mutual fund scheme and also put in a minimum of Rs1,000 a year in their PPF accounts. They are further advised to review their real estate investments periodically (see table Retirement Funding). Education: To build a corpus of Rs75 lakh in today's value for the elder daughter (future value will be Rs98 lakh when she turns 18), the family should allocate the savings bank balance of Rs35 lakh and debt MF investment of Rs20 lakh. This amount should be invested in fixed maturity plans for three years and a monthly SIP of Rs50,000 should be started as well. Invest in equity savings schemes of mutual funds for two years and then review the investment. 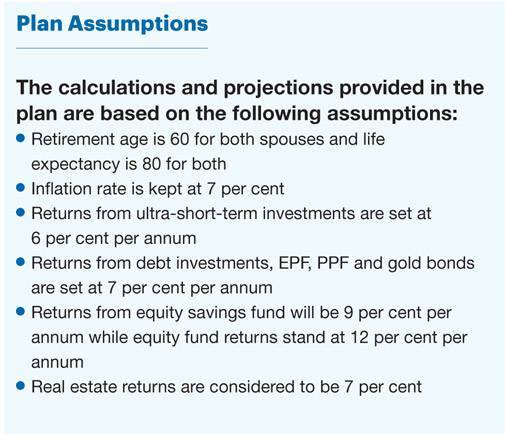 To build a similar corpus for the younger daughter (future value will be Rs1.47 crore when she turns 18), they should allocate 50 per cent of the equity MF investment, or Rs22.5 lakh (Rs70 lakh in future value), and start a monthly SIP of Rs35,000 in the equity scheme of a mutual fund. Marriage fund: Assuming that the elder daughter will marry at the age of 25, the family should build a fund of Rs50 lakh in today's value (future value will be Rs1.05 crore). They should allocate 50 per cent of the gold investment or Rs2.5 lakh (future value will be Rs5.25 lakh), for the same and start a monthly SIP of Rs37,000, Rs34,000 in equity funds and Rs3,000 in a gold bond scheme. A similar fund for their younger daughter (future value will be Rs1.58 crore when she turns 25) will require 50 per cent allocation of the gold investment (current value is Rs2.5 lakh and future value will be Rs8 lakh) and a monthly SIP of Rs23,000, Rs20,000 in equity funds and Rs3,000 in a gold bond scheme. Car purchase: The family wants to buy a car which will cost them around Rs10 lakh in present terms. The maturity proceeds of the LIC plan has been allocated towards this goal.